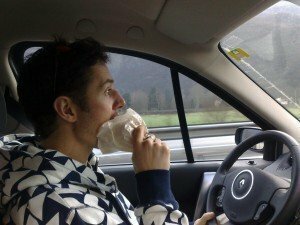 Eating and Driving: Is It Dangerous? Did your morning rush cause you to skip your breakfast again? Planning to trade it for a quick bite during your commute? Not a good idea! Yes, it is bad for your digestive system, but what’s more important, eating and driving is extremely dangerous! Eating behind the wheel is probably the least discussed topic in the list of most common driving distractions. The habit of having a snack or drinking coffee while steering the wheel may seem pretty innocent, but it can have bad consequences for road users; yet this occurs more often than we could think. Like any other distraction, eating is a dangerous activity that takes your attention away from driving. A study done by ExxonMobil surveyed 1,000 drivers and found that over 70% admit to eating behind the wheel and over 83% admit to drinking beverages while driving. Some U.S. cities have already banned this kind of distracted driving. Drivers in Huron, South Dakota will be fined $100 for eating and drinking beverages behind the wheel. You need just a few seconds to grab your sandwich and unwrap it, and that same amount of time is all it takes to lose control of the vehicle due to distraction or hands taken off the steering wheel. Spilled hot drinks are hazardous themselves, not to mention that all the attempts to wipe the spills from your sparkling dress or suit will make you forget about the traffic rules, driving and the road. Fried food and pizza inevitably make your hands greasy and slippery, which gives you less control over the steering wheel and the gear stick. Crumbs, splashes of soda and other dropped bits of food will incite drivers’ instinctive reactions to clean the mess immediately, before it becomes a permanent stain. Needless to say this doesn’t help safe driving. So, by refusing to sip coffee or chew on snacks behind the wheel and instead having meals before or after the trip, you can significantly increase everyone’s safety on the roads. To learn more about potentially dangerous activities, about the ways to recognize and avoid them, take a defensive driving course and become an exceptional driver, who knows how to deal with different road and in-car situations.